Our sterling silver product is electroplated with triple Rhodium, of which the thicknes is up to 3 microns, effectively preventing the silver from getting oxidized and tarnished after long time wearing. ShmilyJewelry promise: quality assurance, full refund for substandard products. 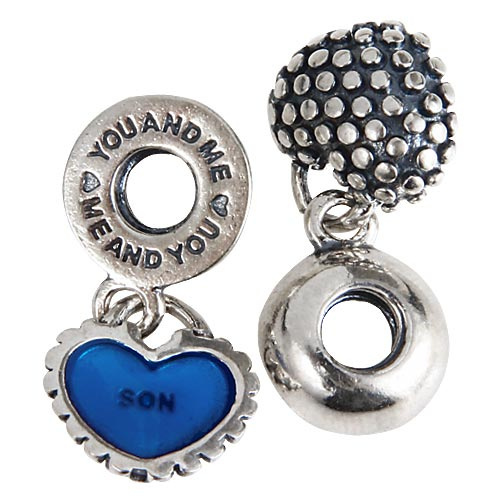 These Mother And Daughter Heart Shape Authentic 925 Sterling Silver Dangle Charms Pendants Beads With Screwed Threaded Hole SDC921 are made of genuine 925 solid sterling silver. They are used for European Style Charm Bracelet and necklace jewelry making, they will give your necklaces and bracelets a beautiful natural touch. For bulk quantity order or customized order, pls contact us directly to confirm the details. 2. If your order is less than 500 usd, we will ship the goods by china post air mail or HK post air mail free; If your order is more than 500 usd, we will ship the goods by EMS or DHL free. 4. Import duties, taxes and charges are not included in the item price or shipping charges. Buyers are responsible for these charges.